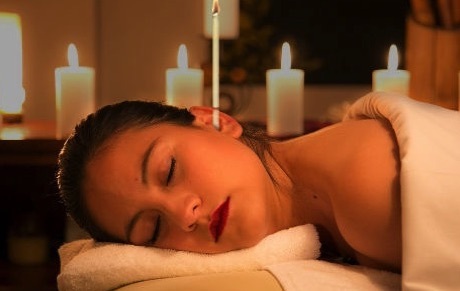 An ancient relaxation treatment to help relieve congested, blocked sinuses and build up of wax and also headaches. This is a soothing treatment which calms the mind, helps harmonise our different energy fields. It is believed the ancient Greeks used them and it has reached the modern world via the native American Hopi Indians. The candles are made from natural ingredients of beeswax, honey, extracts of sage, St. John’s wort, camomile, beta-carotene and organically grown flax. They work on a chimney principle, drawing many impurities to the surface where they can be gently removed. They equalise the pressure in the head and ears making them suitably for most candidates. Secretion flow is gently stimulated and the vapor collects and removes impurities and deposits. Most of these are carried away through the candle chimney, although some of them can be found in the condensed candle wax residue after removal from the ear.